It is with great pleasure that I hereby invite your community to take part in Season 5 of the Mafia Championship. The Mafia Championship is an annual forum tournament series that pits representatives from various online Mafia (aka Werewolf) communities against one another as they compete to determine the Internet’s greatest forum Mafia player. Each participating community democratically elects one person to represent them and be their “Champion”. The whole thing started back in 2013, and since then more than 225 different communities and 50+ different nationalities have been represented. 1. DO YOU ACCEPT THE INVITE? If your community wishes to participate, please confirm your participation to me as soon as you can to ensure yourselves a spot. If you agree to participate, the deadline for selecting your representative is May 1. If this is too soon for you to decide on anyone, let me know and we can work something out. The games will take place on Mafia Universe. If it’s okay, I can link directly to the general discussion thread regarding this topic on Mafia Universe. You may decide yourselves how you want to elect your representative, but we highly recommend some sort of democratic process (public nominations followed by a poll usually works out well). In addition to electing a representative, you should also name an alternate who will be asked to step in if the first choice needs to back out. Your representative should be prepared for having to read upwards of 500 posts per 24 hours during the early stages of the game. Additionally, there’s a requirement that each player must make at least 10 posts per Game Day. Only active players should apply/participate. I repeat: Your chosen player needs to be able to promise a good amount of activity on a daily basis. 170 communities will participate, each sending one representative. 10 Qualifying Games will be played, consisting of 17 players each. I.e. every representative plays in one Qualifying Game. The players themselves vote post-game to determine who is deserving of advancement. 1st place will advance directly to the Finale Game (i.e. 10 of the 17 finalists are found this way), while the 2nd places will advance directly to one of the two Wildcard Games. A Jury consisting of finalists from Season 4 will discuss and vote to determine 25 players in total deserving of a second chance: 1 will advance directly to the finale, and the 24 other players will play in 2 Wildcard Games along with the 2nd places that advanced directly to these. From each game, three players will directly advance to the Finale Game based on a post-game player vote. The Finale Game is played. Once it has completed, the players vote to determine who shall receive the title of Season 5 Champion and a winner’s certificate signed by Dmitry Davidoff, the creator of mafia. This (view picture below) is a semi-open grid setup meant for 17 players: 4 mafia versus 13 townies. First you randomly select a number to decide the mafia team's composition of Power Roles (1-2), then you randomly select a letter to decide the town's composition of Power Roles (A-E). Fill in the number of Vanilla Townies needed to make the town team have 13 members total, and you have your setup. 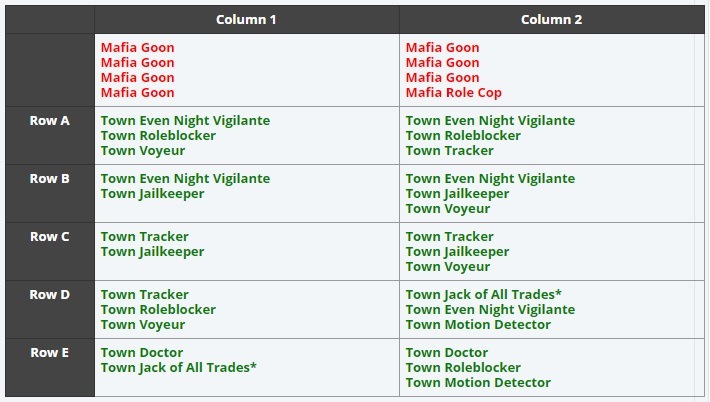 *Town Jack of All Trades: 1x Vigilante, 1x Roleblocker, 1x Tracker. Deadline Lynch w/ Option for Majority starting Day 2. I.e. when day timer runs out, person with most votes will be lynched. However, day can also be ended early (starting Day 2) if there is ever a majority of votes on one person. If there is a tied lynch, one of the tied players will be randomly lynched. No outside communication. I.e. you may not contact the other players outside of the thread (unless you are Mafia and wish to speak with your teammates). Phase Lengths and Deadlines will be up to the players themselves (I’ll organize them into games with deadlines that suit their preferences). Thread is locked during Night Phases. There will be 10 Qualifying Games, and your representative plays in just one of these. They will have start dates during the months of May and June. So in other words, as long as your representative can play sometime during that period, they should be good and I’ll make sure they get scheduled into a game that suits their schedule well. I.e. if your rep is busy until June, that isn’t a problem. Wildcard games will be played in July, and the Finale Game sometime in August/September (whenever we can work out something that suits everyone). If you want to get in contact with me ASAP, you can find me on Discord (Thingyman#6075). wow you're thingyman now fable? moving on up! He literally went "hey copy and paste this on NGA" and I was like sure. Will there be any games of a normal length? 3 week day cycles, 3 day Nights as an example of normal length. The games will probably be 72 hour days and 24 hour nights as the longest possible option for the qualifying round. I nominate fable. Go represent us since you've abandoned us for them anyway. Maybe I'd play here if there was more than one game every 3 months. For real I'd like a chance to try and make finals again, was super close last time. Go Fable! Make us proud!